I need...no, I mean NEED my morning coffee! Plus, I enjoy my morning coffee. I do not believe it is just a caffeine addiction...though I admit, I do not see the point of decaf. And while it is routine, I look at it as more of a ritual...soothing, comforting, necessary. Yup, greeting the morning... just me & my joe (although mexichef joins us if he's not working). Morning breezes, a fresh newspaper, time for brain to wake up. The only downside is when it turns really hot in the mornings. It's hard for me to drink hot coffee when I'm already sweating. So, I do what any coffee-lover does...turn to iced coffee!! This coffee was cool and refreshing...and it still got my motor running! 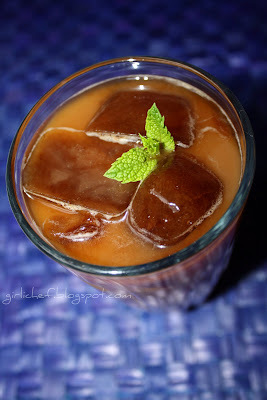 Chilled Coffee-Mint Cooler from girlichef's kitchen Coffee Ice Cubes (pour your leftover coffee into ice cube molds & freeze...it won't water your coffee down!!) 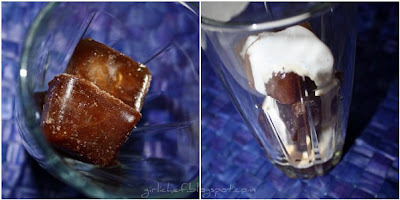 Minty Simple Syrup (recipe here) Cream or Half & Half Fresh Brewed Coffee Mint leaves for garnish Place coffee ice cubes about 3/4 of the way up your glass. Add minty simple syrup and some cream (these are both to your liking). Pour in freshly brewed coffee, leaving about 1/2" to top of glass. Stir. Add more coffee ice cubes to fill glass. Garnish with a sprig of mint. I am sending this over to Rebecca of Chow & Chatter for her Coffee Giveaway Contest!! ***p.s....don't forget to eat your greens (and then send me a link)!! YES! I LOVe this, Heather! I'm a total coffee addict as well, and this is a fabulous way to have my cup of joe in the hot summer mornings! I would never have thought of combining mint & coffee! I'll have to try that out sometime in another context (I don't drink coffee). I ONLY drink iced coffee -even in winter - so this is right up my alley! same here. It is the whole routine of making coffee and sitting a sipping a hot cup with the morning newspaper..thats what i need every morning. More than just the coffee and i think i need hot coffee however hot the weather is! I like iced coffee. I like the added mint flavor to this. Perfect for the upcoming summer weather. Woo! Love the coffee cubes!! Great idea cuz I never finish the pot and end up pouring out. hmmm wonder what other flavors of simple syrup I could use in that (not a huge mint fan). This sounds so delicious with the mint syrup in it! What a nice treat to wake up to. I forget how much I love iced coffee - used to be a standy by of mine in NYC. The mint syrup - oh so refreshing. Can I now drink it off the page? Never thought of putting mint in my coffee, wow I am going to love it! I always have a cup of coffee in a morning! 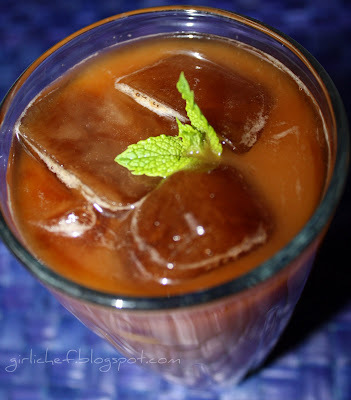 This ice coffee will be perfect for hot days, love the addition of mint! Girlichef, you're a woman after my own heart. 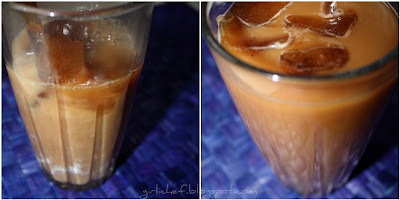 Love, love, love this version of iced coffee. Thanks sweetie. I am lost without my morning coffee! My best friend (a new mommy) called me up before I poured my first cup this morning. She was like, "You sound funny." Yeah. I hadn't had my morning cup of joe! This sounds and looks perfect. I love the idea of coffee ice cubes so that my coffee doesn't get all watery. Thanks, Heather! What a "cool" idea! Get it, ice cubes, cool... Ha! :0) I've got to try it tomorrow! Great entry for the contest! you are new friends for loving coffee as much s i do! i have about 4 shots of Cuban espresso before 10, and then another 4 around 3! the best thing ever. nice to have found your blog! I can't wait to try this coffee. It sounds amazing! Love iced coffee this time of year! so essential for the frisky yarn bomber in me! I prefer mine intravenously. Can I join the club:-). Just what I need to wake up this morning. great for the summer.. thanx for the perfect recipe..
Nice! I love coffee, any way shape or form. Love mocha iced coffee the most...hey, "mint mocha" iced coffee sounds even better, thanks for the idea girl! I totally get you - I have 2 cups in the morning first thing. 2 more when I get to work (but I'm on vacation this week...hehe) and then an afternon cuppa around 3. What a cool idea (no pun intended)to freeze leftover coffee. A perfect pick me up anytime of day! Just the photo woke me right up! Great idea with the coffee ice cubes! What a refreshing way to drink your coffee! Brilliant! I'm like you...gotta have my coffee, but you are right...in the summer, it just seems kind of "wrong", so iced it will be!! I have mint in my garden too. Gotta have coffee, coffee, coffee!!! Why oh WHY have I not thought of Coffee Ice cubes before? I ask you, one fellow coffee obsessed to another... It's nothing more than PURE GENIUS!!! I am now going to start drinking iced coffee in the summer... AWESOME!!! The coffee ice cubes are a great idea for this delicious drink. By the way I meant to say, love the picture of your adorable daughter in the last post. What a cool and refreshing way to start the day!! That coffee cubes look soo good n I cant do without a coffeee either..
Love coffee cubes, don't like having iced coffee without them. Course I only drink decaf, can't have caffeine. Just wonderful. I love the coffee icecubes. Coffee is obligatory... black, hot (or cold :) ) and strong. I love simple syrups. They're so easy to make. Also, I was listening to your blog when Acid by Ray Barretto came on. I just bought it off iTunes because I liked it so much. I love Coffee ! I have to have my american coffee or my cuban coffee or my Greek coffee I just love coffee. Thanks for sharing:)Your Coffee recipe. This looks so good and I bet it's very refreshing for summer. I am dying for some coffee! I have been sick and have stuck with tea for three days! Oh fabulous! I grew up stealing sips of my mom's milky, sweet iced coffee and this brings it all back! Mmmm. Need to switch to iced coffee this summer. Back when I made iced coffee all the time, I always had frozen coffee cubes too! I want one of these now!!! What a great little coffee recipe! The minty simple syrup make this very fresh. The coffee ice cubes are brilliant! The only thing I'd do differently? Gotta get the mocha groove going - let's put some cocoa in there! Iced coffee is my fave-- iced mocha lattes. mmmmm!